Here are some of the Film’s From Fridays Columbus festival. I was very proud of the classes and all the hard work they put into these films. We also had a food festival to follow featuring Chinese, Cuban, Spanish and Italian cuisine. Columbus PodCast #2 By Eric E. and Jon V.
Columbus Podcast #1 by Howard, Melvin & Lexus. Here is the first of our Columbus Podcasts. This one features Melvin, Howard and Lexus. In studying Columbus and his voyage of 1492 we know he did not want to sail east,going around Africa to get to China and the Indes. That was the way everyone had sailed before him. Columbus sailed west, which would have worked if he did not bump into North and South America. 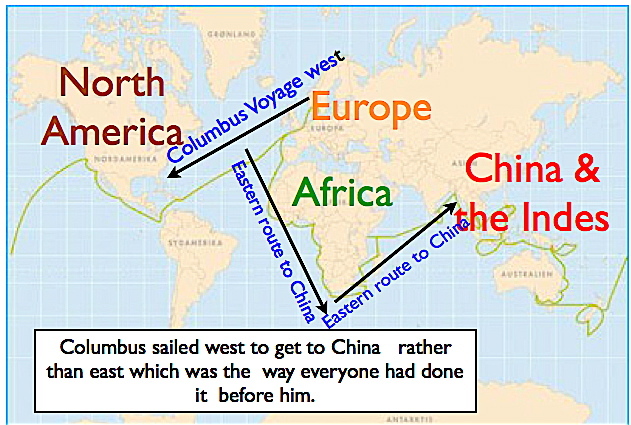 Refer to the Map below to review and compare Columbus’ route west with traditional route traveled east. Click on the Compass rose to watch as short movie on directions and cardinal directions. After you watch the movies print out the blank compass rose and see if you can put in the correct directions. Write a short piece on what you learned from the movie. When did he know he wanted to be a sailor? What was Columbus dream ? What special voyage did Columbus want to make, where to ? How did he get the money for the voyage he wanted to make? What was the voyage on the boats like? What was the name of the three boats Columbus took with him? How did his crew feel when they were on the boat? Were they afraid? What was the crew going to do if Columbus did not find land soon ( after 2 months)? 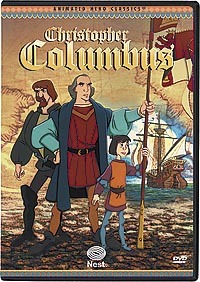 What happened to Columbus? Did he find India / China? What place did he discover?